Triumph Motorcycles was first showcased in India during the Auto Expo held in 2012. Today the UK based motorcycle company has launched ten motorcycles in India, all of them are divided into categories like: Classics, Roadsters, Adventure, Super Sports and Cruisers. Triumph is looking forward for great success in the Indian market, the first plant for manufacturing Triumph motorcycles in India is located in Manesar. Some of the famous bikes launched by Tiumph in India today are Thruxton, Speed Triple, Tiger Explorer and Rocket III Roadster. With the launch of the Triumph, we have brought the world’s most iconic premier motorcycle brand to India, Triumph is not just a motorcycle, but a way of life. India is an exceptionally exciting market for us and the premium motorcycle segment in the country is seeing a tremendous growth. We feel this the right time to establish our foothold here. He further said that Triumph will be the only motorcycle brand in India which will offer a complete choice of motorcycles to suite people’s riding preferences. The Classics segment for Triumph India includes a total of three bikes, Bonneville, Bonneville T100 and the famous Thruxton. The price range of these bikes start from 5.7 lakh to 6.7 lakh. The Triumph Bonneville is the flagship for the classic series from the company, the bike is powered by a 865 cc engine. Triumph Bonneville delivers a horsepower of 68PS/67bhp/50kW @7500 rpm, and a torque of 68nM/50ft.lbs @5800 rpm. The height of the Triumph Bonneville is 1130 mm and it will be available in Phantom Black, Crystal White/Sapphire Blue, Lunar Silver. The company has attached a price tag of 5,70,000 INR Ex-Showroom for this Air Cooled bike in India. The Triumph Bonneville T100 shares the same features like the Bonneville, as the bike is powered by a 865 cc air cooled engine. Triumph Bonneville delivers a horsepower of 68PS/67bhp/50kW @7500 rpm, and a torque of 68nM/50ft.lbs @5800 rpm. However, the height of the Triumph Bonneville is 1100 mm and it will be available in Jet Black/ Cranberry Red, Fusion White/ Aurum Gold. This bike is priced at 6,60,000 INR in India. 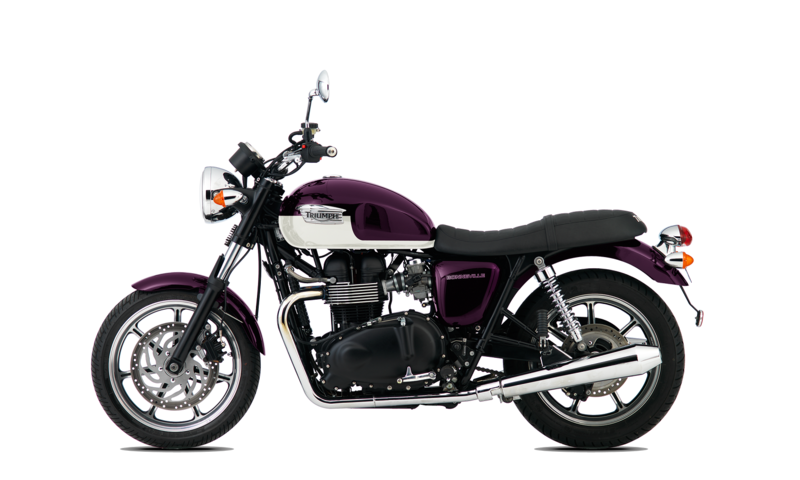 The third and the last bike in the Classics segment from Triumph India includes, Triumph Thruxton. This bike from the company gives a horsepower of 69PS, 68 bhp @7400 rpm. Triumph Thruxton is powered by a 865 cc air cooled engine. 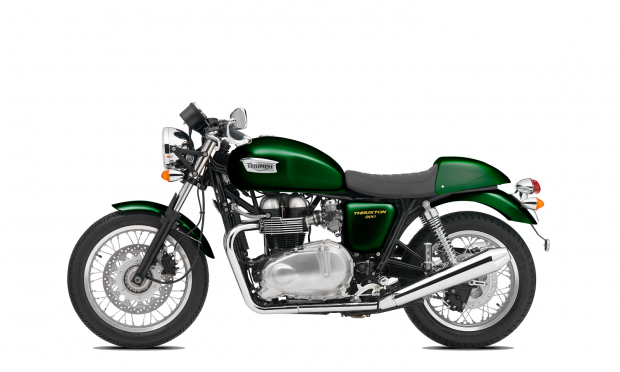 Thruxton is available in two colors the regular Black and the unique and good looking Brooklands Green. Triumph has launched this bike in India a price of 6,70,000 INR. With the launch of these classic motorcycles in India, Triumph says “it’s not about what we have added to these motorcycles over the years, its about what we haven’t taken away”. Triumph claims that the Roadster segment of bikes will do great in the Indian market. This segment includes a total of two bikes: Street Triple and the Speed Triple. Triumph Street Triple shares a naked design, not much heavily built. The bike is powered by a 675 cc liquid cooled engine which generates a horsepower of 106PS, 105 bhp, 78kW @11850 rpm. The engine on the bike is a 12 valve, DOHC, in line 3 cylinder type. 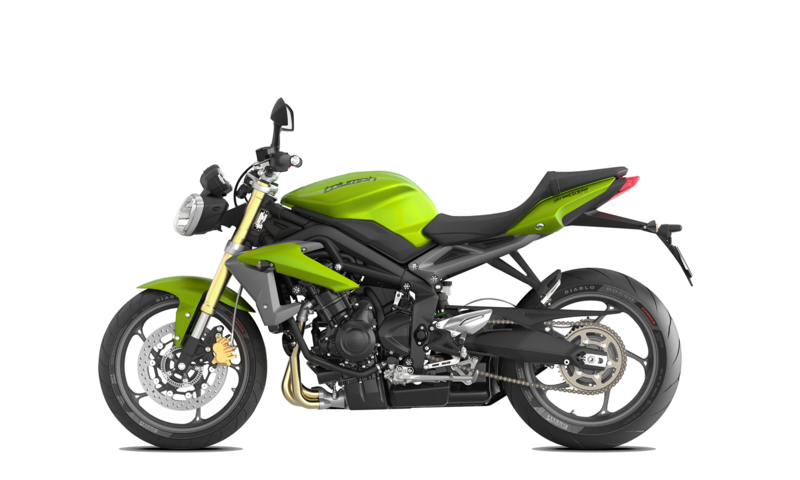 Triumph Street Triple has a height of 1060 mm and will be available in Phantom Black, Crystal White, Caribbean Blue and Cosmic green as shown in the image above. The bike is priced in India at 7,50,000 INR Ex-showroom. The Speed Triple shares almost the same design to the Street Triple, but the difference lies beneath. 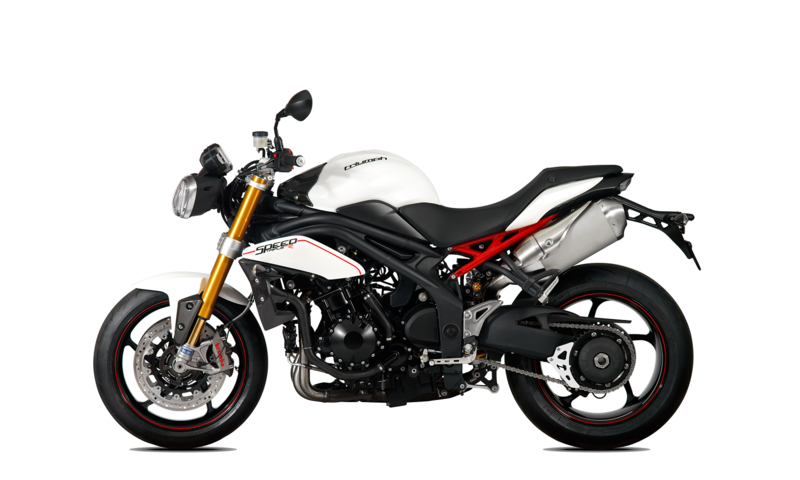 Triumph Speed Triple is powered by a 1050 cc liquid cooled, 12 valve engine. The engine on this bike will generate a horsepower of 135 PS/ 133 bhp, 99kW @ 9400rpm, which goes in the favor of the bike’s name, Speed ‘Triple’. 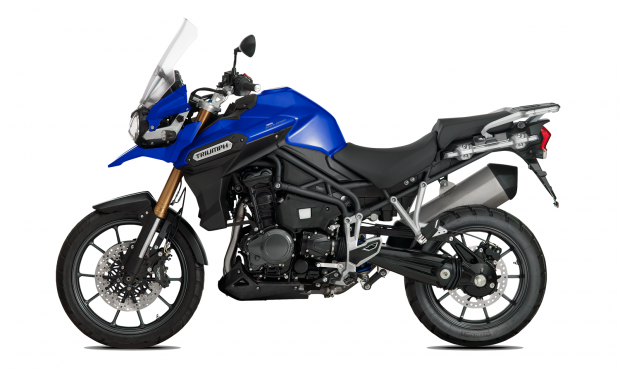 Triumph Speed Triple will be available in Phantom Black, Crystal White and Matt Caspian Blue colors. This bike is priced at 10,40,000 INR for India. Adding to the Roadster line up of the bikes, Triumph says: “If it doesn’t enhance the power, handling, feel or sound of the bike, it doesn’t go on it”. Adventure, this word comes into the mind when your first see this bike along with the thoughts of riding it off the roads. The Triumph Tiger 800 XC is powered by a 799 cc liquid cooled engine which generates a horsepower of 95 PS/ 94 bhp/ 70kW @9300 rpm. The engine is a 12 valve in line 3 cylinder type. This 1390 mm height bike is available in Matt Khaki Green, crystal White and Phantom Black colors. The Triumph Tiger 800 XC is priced at 12,00,000 INR. 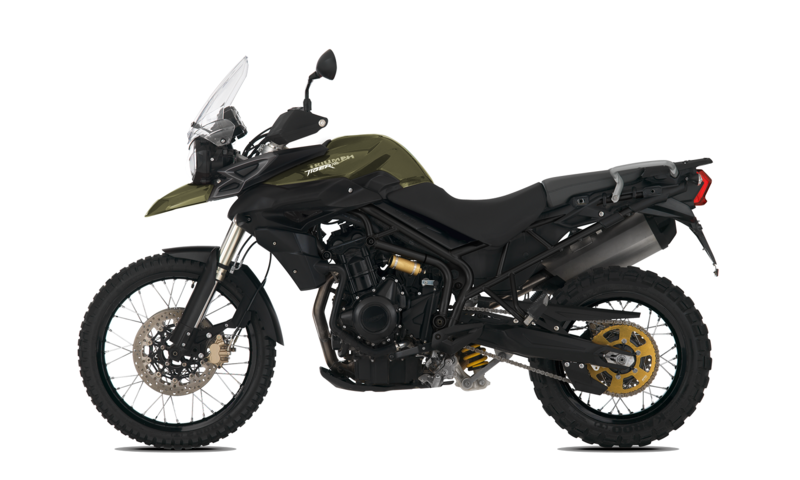 The Tiger Explorer XC is more powerful than the Tiger 800, in other words this is the big brother for Tiger 800. Triumph Tiger Explorer is powered by a 1215 cc liquid cooled engine, The horsepower generated by the engine is 137 PS/ 135 bhp/ 101 kW @9300rpm. This bike from the company will be available in Matt khaki Green, Crystal White and Graphite colors. This 1410 mm height bike will cost you 17,90,000 INR. With its Adventure line up of bike’s the company says: “We know know it’s not just about where you can go, it’s how you get there. Wherever ‘the’ ends up being. Whenever you think about Triumph, one name that most people recall is the Daytona. 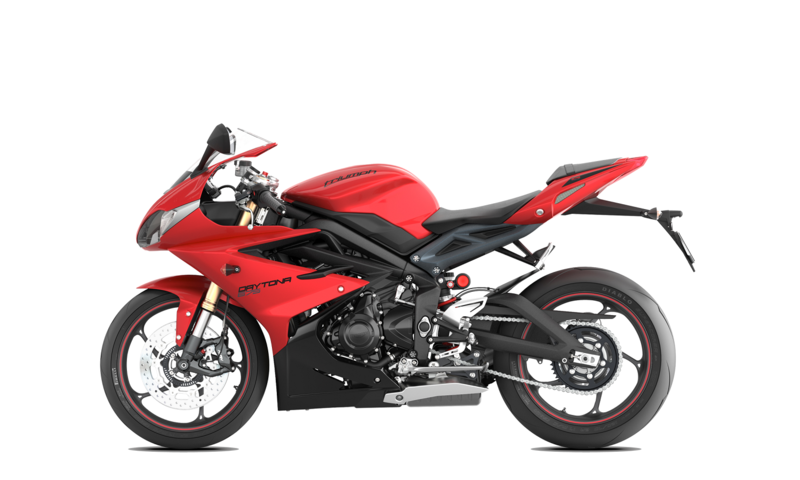 Triumph has launched Daytona 675R in its Super Sports category in India. The Triumph Daytona 675R is powered by a 675 cc liquid cooled engine. The engine generates a horsepower of 128PS/ 126bhp, 94kW @ 12500rpm, which makes it the right fir in the Sports category. Vimal Sumbly, MD for Triumph India said that he thinks there is not competition in the market for this bike yet. This bike is available in Crystal White/Jet black color and is priced at 11,40,000,INR. Lastly, the cruiser segment for Triumph include two bikes, the Thunderbird Storm and the epic Rocket III Roadster. These are not only some good looking machines, but they offer great comfort. 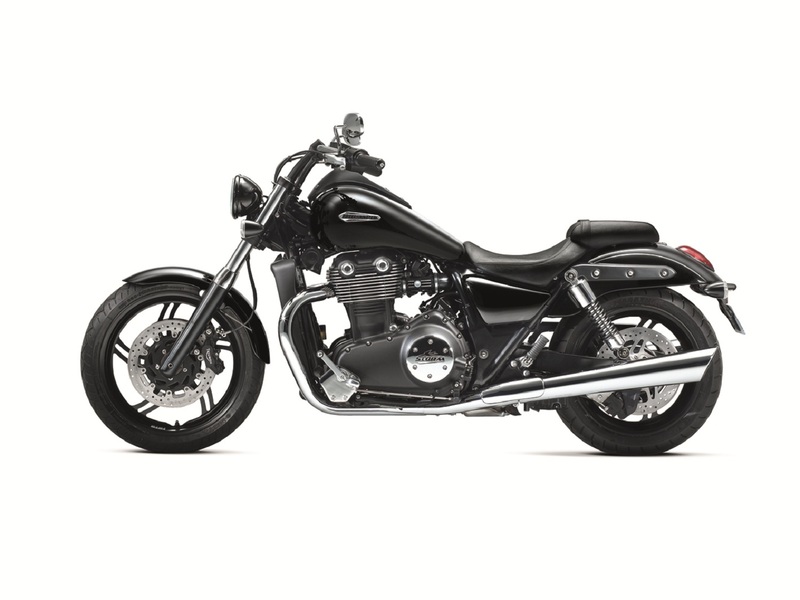 Triumph’s Thunderbird Storm is a true cruiser bike, it offers great comfort and power. The Thunderbird Storm is powered by a 1699 cc liquid cooled engine. The engine on the bike generates a horsepower of 98PS/ 97bhp, 72 kW @5200 rpm. This bike is available Matt Black, Graphite Black and Jet Black color options. The Triumph Thunderbird Storm is priced at 13,00,000 lakh INR in India. The king of all cruising bikes, for the looks, power, comfort and even the price it is released at. The Triumph Rocket III Roadster completely justify its name ‘Rocket’. The bike is powered by a 2294 cc liquid cooled engine. The engine on the bikes delivers a horsepower of 149 PS/ 146 bhp and 109 kW @5750 rpm. 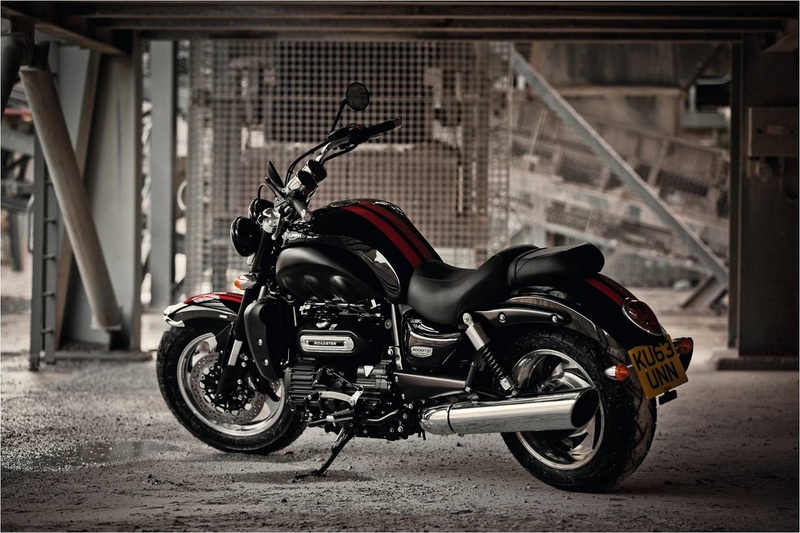 The Triumph Rocket III Roadster is a huge bike, but the height remains 1165 mm which should not be a problem. This bike is priced at 20,00,000 INR Ex-showroom in India. All these motorcycles will be open for booking in the second week of December 2013. Triumph dealerships will be available in Delhi, Mumbai and Bangalore for the first phase. In the second phase this will expand to cities like Pune, Ahmedabad, Chandigarh, Jaipur, Chennai, Hyderabad, Cochin and Goa. All these bikes will be sold with a 2 years unlimited kilometer warranty. Alongside the bikes, Triumph has also launched merchandise in India, which includes jackets, t shirts etc. The company has also launched a wide range of accessories for the bikes.